Platinum estate diamond engagement ring with truly magnificent Colombian emerald: Description by Adin Antique Jewelry. 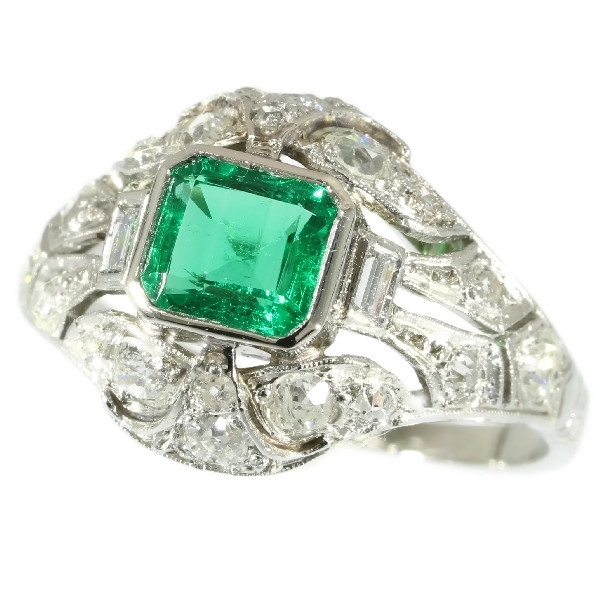 In this elegant platinum Estate engagement ring from 1920, the natural Colombian emerald emanates its verdant green colour over eight grand old mine brilliant cut diamonds and ten smaller old mine single brilliant cut diamonds. On the front and the back of that stunning centre, a tip with two diamonds is folded across a diamond cushion to reach the emerald providing extra fire. On the left and the right, two baguette cut diamonds flank the 1.03 carat gem like guardians. From here, another two diamonds in a lozenge pierced pattern shoot just like stars to the diamonds in the jewel's shank. The lustre in every azured setting will set off your everlasting eve of affection filled with diamond blankets and stars topped with a blooming emerald. Diamond(s): Eight old mine brilliant cut diamonds with an estimated weight of ± 1.00ct. ; Ten old mine single brilliant cut diamonds (also called 8/8) with an estimated weight of ± 0.38ct. ; Two baguette (long rectangular) cut diamonds with an estimated weight of ± 0.12ct. Total diamond weight: approx. 1.50 crt. (colour and clarity: G/I, si/i).